Hi, my name is Andrew (Andy) I live in North Wales, UK with my lovely partner Judy. 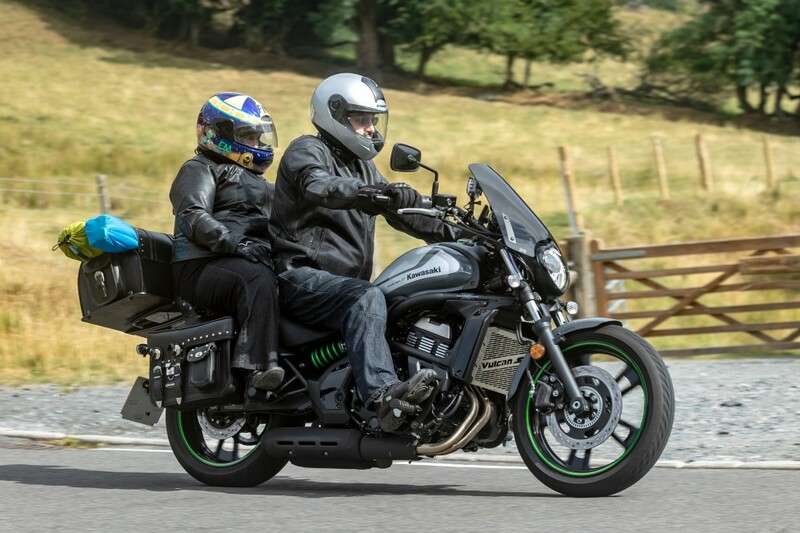 We are keen motorcyclists and love getting out on the bike whenever the British weather allows. I am currently training for an advanced rider qualification and hope to volunteer my time and skills to Blood Bikes here in North Wales. Blood Bikers are a charity which transport blood and other substances etc around the UK which eases the workload and expense on the cash strapped National Health Service. I am not new to the Internet and have 2 websites serving my offline business but looking to move online during the next 5 years to provide an income for/during my retirement years. Also I will say this is not my first time here at WA as I became a member about 18 months/2 years ago but due to a serious illness which decimated my income/savings I unfortunately had to prioritize my funds and reluctantly gave up my membership here. I am now back working in my business and WA was one of my first priorities to get back up and running. My health is still an issue and I am waiting on an operation which is all the more reason for me to make a success of my online efforts as my offline business is very manual oriented work and coming up to the young age of 60 it is time for a change of direction. I am delighted to be back here at Wealthy Affiliate and already have seen some familiar faces. I wish each and every one of you, new and established members, the very best success in your ventures. Thank you Laura, I do appreciate all the welcomes and advice. Thanks for the follow and welcome back! Wishing you much success here in WA on your 2nd trip around! Was wondering if you do the TT race on the Isle of Man. One of the events I would like to see being I have a bit of Manx blood in me! We and the bike booked for TT week 2019 (health permitting), ferry and accommodation books up about a year in advance. Looking forward to doing Mad Sunday when all the spectators, 1000's, get to ride the course. I haven't been for a few years , first went in 1976 and probably been about 15 times since. It must have been a fun bike ride! Was reading about a bike enthusiast from that area who custom building Norton's. Hello Andy And Welcome To Wealthy Affiliate. Since you joined and with your previous WA and other online experience you may well have come to the conclusion that internet marketing is a steep learning curve. Thank you Robert, I appreciate your comments and like. No probs Andy and if/when you read my blogs make sure you choose the ones that will help you in conjunction with whatever training you are currently taking. I have friends in the south in Port Talbot and was down for a visit in the summer. Welcome to the community. By choosing to join us, you've already proven to be a person reaching for the stars, highly motivated, and destined for success. Please don't forget to FOLLOW BACK - LIKE- AND THANK FOR THE FOLLOW! So, thanks in advance for the follow and even more for the LIKE! Take it slow and stick to it. The community will help you realize your dreams. Thank you Paul, appreciate this. Hi a1jonk1! I just wanted to congratulate you on becoming a premium member with WA. I did so myself several weeks ago and I certainly have no regrets. You won't regret your decision either. There is a wealth of support and information at your fingertips here. Best of success to you! Thank You, that is appreciated. It's nice to meet you. Thank you very much for following me. I am following you back. Thank You Derek, much appreciated. Thank You Joe, much appreciated. Welcome, welcome! You've landed in a great place! Wishing you every success as Premium Wealthy Affiliate. Thanks Zed, much appreciate that. Thank You Ray, I appreciate your comment. Thank You Shui, returned the follow. Hi...nice to have you in the community. An Online business takes some time so it's great that you start developing it now. Thanks for networking with me. Thank You Debbie, appreciate the comment and follow. Hello Andy,♫Welcome! I am so pleased you found WA. Nice to meet you ツ I wish you a lot of learning pleasure and fun at WA. Thank you for adding me to your network. Thank You Loes, I do appreciate your time and comment. Thank You KerryAnn, I appreciate the comment and starting advice. I believe you have made a wise decision to become more involved at the WA site. As you will see, there is a tremendous community here with people anxious to help you achieve your goals. I would suggest you take the step-by-step course starting at Level 1, don't skip anything, and gradually you will obtain more and more skills to figure out how to make a good Wordpress page, and how to get your business going as well. If you have questions along the way, there is a help center available, and I would be glad to try to help if I can! Hey Andy and welcome to Wealthy Affiliate! I am Kyle, co-founder of Wealthy Affiliate and I am here to help you along the way. If you ever have any questions or need a hand with anything, do let me know. Anyways Andy, thought I would just introduce myself and if you have any questions going forward, let me know. :) Wonderful to have you as part of the community here at WA!